You know how some days, going to the studio and getting started on artwork just feels like a slog? You drag your feet. You have trouble getting started and keep finding reasons to procrastinate--the shelves in the refrigerator need to be wiped down! I need to dust the bookshelves! Today was not one of those days. I got started at 8:00 and enjoyed the rare feeling of creative flow as I moved from one project to the next. This was the kind of day that reminds me why I stick with this fiber art stuff. First, I wove today's segment of my new tapestry diary of the liturgical year. We are in the third day of the twelve days of Christmas, a season whose color is white. It's hard to make out, but I have added a line of metallic silver that appears here and there in the white sections. The unwoven sections of empty warps represent days I was away from the loom, either out of town or, embarrassingly, just forgot my new daily practice. Then I turned to winding a warp for my next wearable project, a commissioned infinity wrap for a friend. 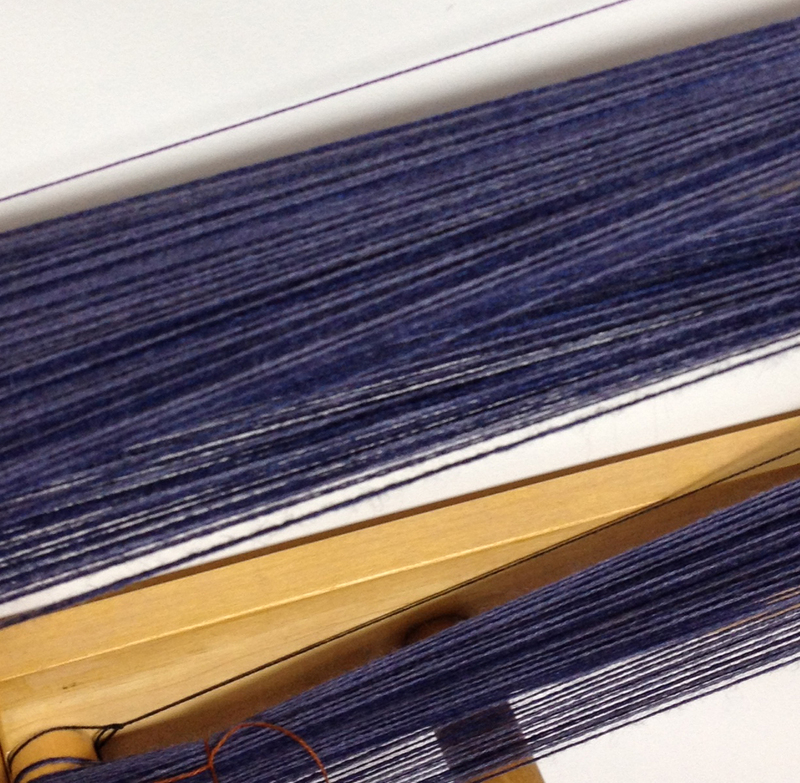 She has chosen gorgeous navy and dusky blue alpaca-silk. Two closely related hues add a depth of color that a single solid color just doesn't have. I'm putting on a warp of almost 8 yards so I'll have enough for two additional wraps as well. I love the feeling of this yarn flowing through my fingers! Then I thought, Before I put this new warp on the loom I'd better be sure the cloth I'd just woven for another commissioned wrap was actually going to make an acceptable piece. 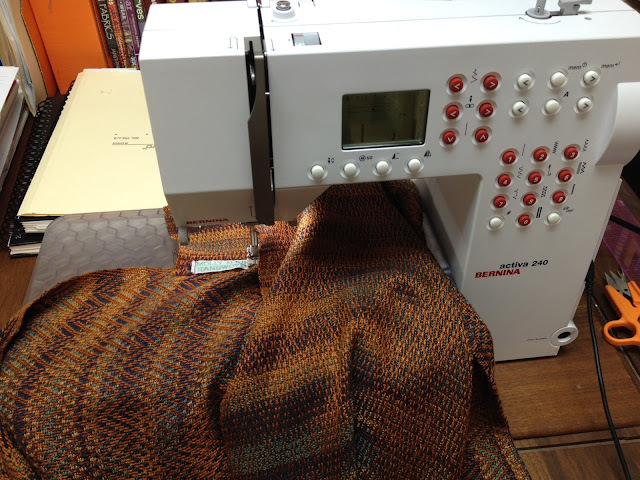 So I sewed the three lengths of cloth I'd woven into infinity wraps. So simple--two seams and you're done. I had fun with this warp, varying the treadling for different weave structures and also using different variegated tencel yarns. Lots of variety from one warp! The commissioned piece is on the far left; the center and right one are the first pieces in next year's inventory. 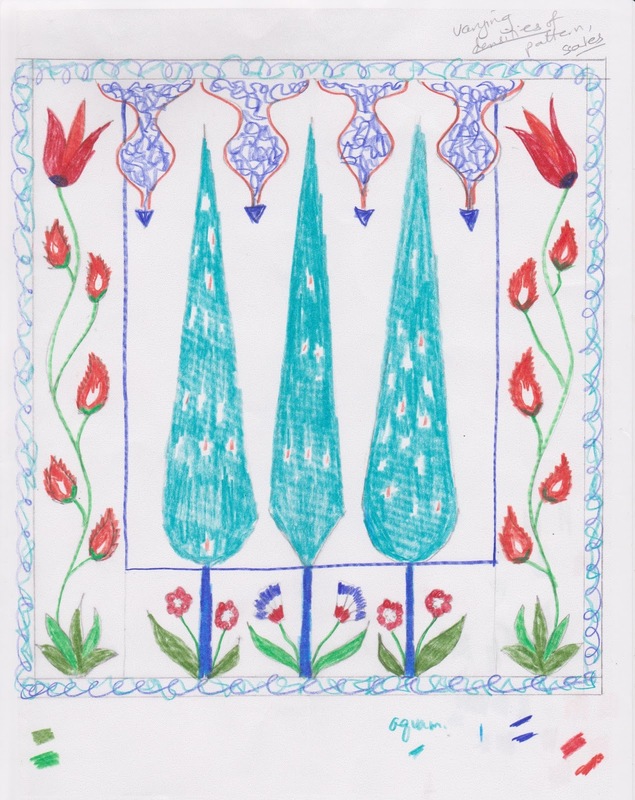 Then I turned to my Turkish-inspired bed quilt. 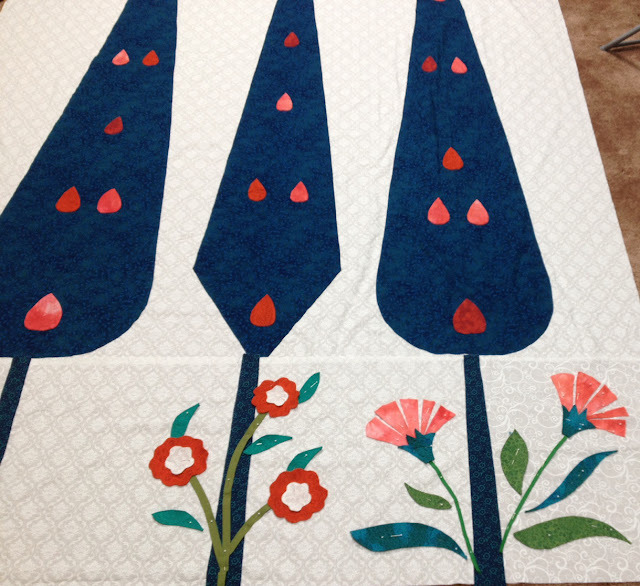 I have appliqued the blue trees with their red and orange teardrop shapes. Yesterday I made some real headway on designing and preparing the applique flowers for the bottom panel and was eager to see what more I could do today. I need some hand-applique to do in front of the TV in the evening! One more set of flowers will be added below the tree on the far left. 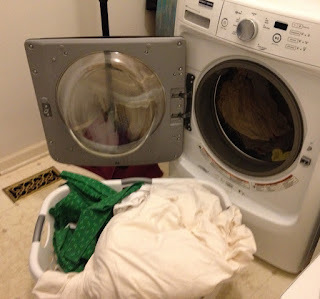 Oh, and since it was Monday, there was laundry to be done. Chores intervene even on the best studio days. 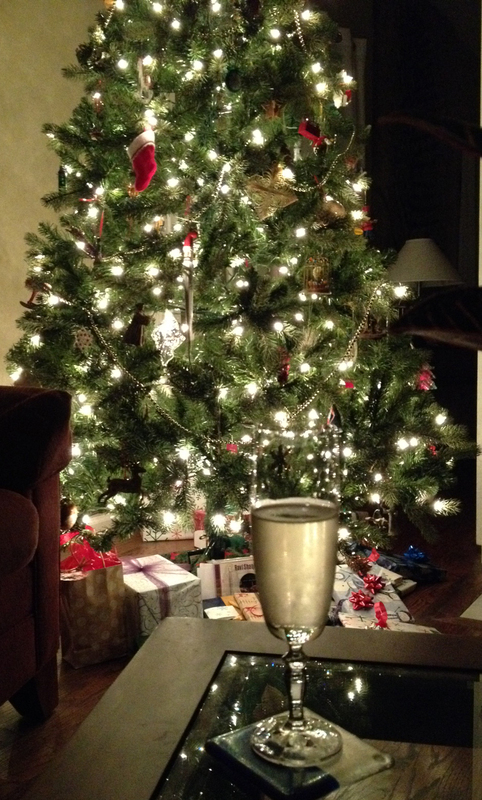 May your days be merry and bright. . .
My wish for you this holiday season, whatever your tradition, is peace, light, stillness. . . and laughter, love, and joy with those you love. Last week I wrote about THIS article in American Craft magazine, considering the distinctions between hobbyists and professional craft artists. I described how art historian Carolyn Fowler proposes that the key distinction revolves around whether the craftsperson "engage[s] questions in their work that interest the world of art and craft." Fowler goes on to say that hobbyists may engage different, but equally valid and interesting questions. 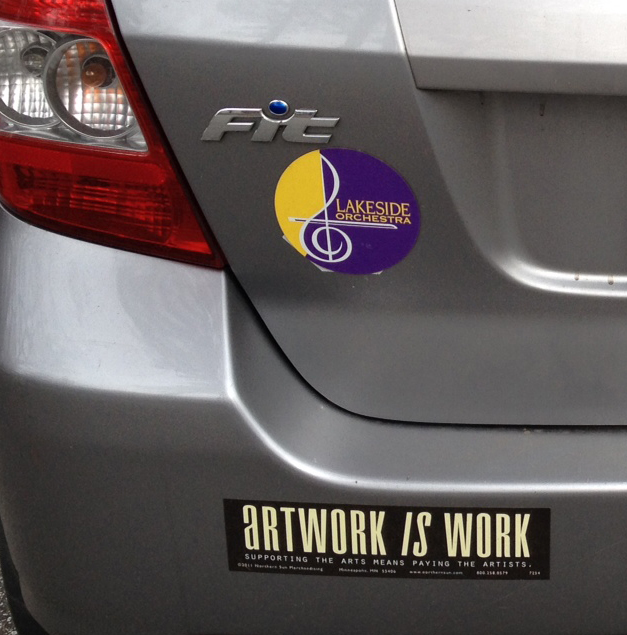 What does it mean to "engage questions in [craft] work that interest the world of art and craft" though? That is truly the issue, I believe, and perhaps the clearest distinction between those who can be called serious craftspeople and those who may simply enjoy keeping their hands busy while they watch TV. Not that there's anything wrong with that! Lest you think I am an anti-hobbyist snob, let me point out that the bed quilt I am currently making is reserved for stitching on in front of the TV. While I designed it myself (not in front of the TV! 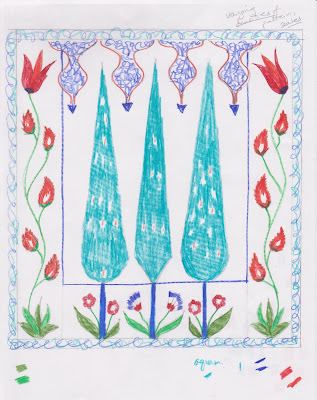 ), I have adapted the motifs from other sources (Turkish tiles), and it follows all the rules of a conventional quilt: made to be used on a bed, comprised of three layers stitched together, made of commercially produced printed cottons and constructed by conventional applique and piecing. It is not innovative; there is nothing at all about it that would "interest the world of art and craft" but this project offers pleasure in the making, personal meaning and utility for me. And for this project, that is enough. And yet I consider myself a serious, professional crafts maker as well. 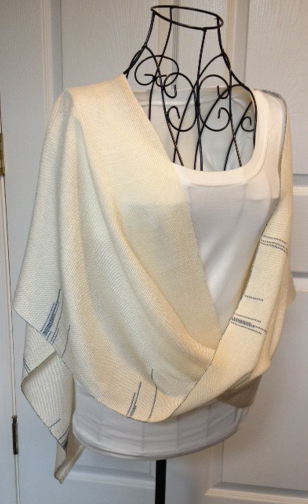 I was flabbergasted that I sold nearly all of my fall/winter inventory of handwoven wearables this year! Perhaps a person can be both a hobbyist, on certain occasions or for certain projects, and a professional craft artist, in other contexts or mediums, at the same time? Perhaps one distinction between hobby work and professional work is that the aim of the former is personal pleasure, utility, and meaning, while the aim of the latter may incorporate all those but also seek to engage a wider audience. For the hobbyist, the point is to experience the joy of working with one's hands, with materials one enjoys, to hone one's skills and to make something useful and meaningful for one's home or for gifts for friends and family--all valid and satisfying intentions. The professional does all those things but is making work designed for a wider audience, in full awareness of other work, past and present, that has been done in her medium. When I weave scarves, shawls and wraps for sale, I am thinking not of my own favorite colors, but of colors that are current, popular, and versatile with most women's wardrobes. I am thinking of designs that women of varied body shapes and sizes can wear in daily life. I am thinking of how my pieces can be unique, special luxury items that are nonetheless affordable. I am thinking of what I can accomplish on my loom, with my skills, using materials that I can easily obtain. But this work still does not "engage questions that interest the world of art and craft," because it is responding to what is rather than what could be. It is essentially practical, traditional and market-based. Two weeks ago I visited the Iris van Herpen exhibit currently at the High Museum. It is a mind-boggling show of what is possible in fashion for someone who not only thinks outside the box, but doesn't seem to have ever encountered the box to begin with! Iris van Herpen, a young Dutch designer, addresses the supreme question that engages the contemporary world of art and craft--how to make it new. She makes work using materials, structures, and processes that to my knowledge have never been used in fashion before. Her designs are inspired by new information gleaned from science and technology. In my view her designs are sculptures that happen to hang on a woman's body, rather than clothes a woman can wear in daily life. This is craft raised to the level of art because it engages a very old question--how to cover the body--in startlingly original ways that acknowledge the contemporary world of ideas. Van Herpen's work makes fashion truly new. Chemical Crows, Skirt, Collar, January 2008; Ribs of children's umbrella, industrial boat filament yarns, cow leather, and metal eyelets. Image courtesy of High Museum website. In my own studio, I do attempt to engage questions of interest to the wider world of art and craft when I design and weave tapestry. I am attempting to make it new, not by innovations in tapestry technique or materials (yet), but by exploring very old themes and subject matter in a contemporary context. One question I am engaging is "Can anything meaningful to contemporary viewers possibly be said about the Virgin Mary in the medium of tapestry?" It is too soon to say. For me now, the attempt is utterly absorbing. The important thing, I think, is to be aware of what you are about, what your intentions are, when you engage in making. Whether you consider yourself a hobbyist or a professional, what questions are you engaging? Do you see yourself moving fluidly between categories, or firmly in one camp or the other? How is your approach to your work influenced by how you define yourself? Deep questions! Feel free to share in the comments below. There was an interesting article in the October/November issue of American Craft, entitled "Who's Afraid of Amateurs?" You can read the article HERE. 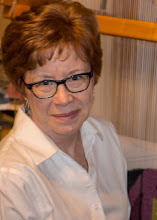 Writer Monica Moses interviews Cynthia Fowler, an art historian who chairs the art department at Emmanuel College in Boston and has been researching craft hobbyists. Fowler had some thought-provoking observations for those of us interested in craft, whether we are professionals or hobbyists or something in-between. It turns out I have so much to say in response to this article that I have split this post into two parts. Fowler considers whether training is what distinguishes professionals from amateurs, or the ability to sell one's work consistently, but she notes that many successful professional craft artists are self-taught, while formally trained ones may be unable to sell their work. So formal training and the ability to sell one's work are not really helpful in making distinctions. Fowler points out that professional studio craft artists (such as those featured in American Craft magazine or at the highly regarded ACC shows) are leery of being lumped together with hobbyists. Fiber artists are particularly leery, given the ways in which their medium has long been marginalized by a critical and scholarly establishment that privileges art by (white, male, Western) painters and sculptors. Fowler invites us to question "what interests are being served by maintaining a highly regulated boundary between the two categories" of professional and hobbyist craft, and who is excluded when one category is considered worthy of art-world attention and the other is not. This is an excellent point, closely related to the old debate about where to draw the line between art and craft, and while it's an important question, it's not what I'm most interested in today. In the American Craft article, Fowler goes on to point out that professionals and amateurs actually have a great deal in common, starting with a deep respect for their materials and processes and a desire to grow in their own creative skills. Indeed, many (most?) craft professionals likely started as hobbyists. I made quilts as a hobby for a few years before I decided to take the next step and go to graduate school for formal training--and I found out about that grad school program at my local guild meeting of "amateur" quilters! My current guilds, the Chattahoochee Handweavers Guild, Southeast Fiber Arts Alliance (SEFAA), and Tapestry Weavers South are a lively mix of professionals and amateurs, and we all are constantly learning from each other and supporting each others' efforts. Any line that might exist between hobbyists and professionals is a pretty porous one in the fellowship of these groups. In fact, the classes I am currently offering through these guilds and, I'm excited to report, at next summer's national weaving conference, Convergence, are aimed at those makers who may straddle the line between hobbyist and professional. My students are fiber crafters who want to go beyond simply acquiring new techniques to understand more fully and control more effectively the fundamental elements of the design process. If you are a fiber artist who is hungry to learn concepts and approaches to design that you can apply to whatever medium or technique you may be exploring, look HERE for descriptions of my current classes and HERE for my 2016 schedule. "Craftspeople who achieve the status of [Lino] Tagliapietra ['often called the world's greatest glassblower'] do so in part because they engage questions in their work that interest the world of art and craft." Hmmm. What does it mean exactly to "engage questions in [one's] work that interest the world of art and craft"? This is where I'd like to pick up the discussion next week. If this topic interests you, go ahead and read the two-page article HERE. In recent years more and more tapestry weavers have taken up the practice of weaving a tapestry diary, a piece in which they weave a tiny section of a tapestry every day for a year. It's similar to the "daily painting" practice many painters employ, only in this case it is cumulative. At the end of the year you have one giant woven piece, or perhaps several pieces that hang together. Click HERE to read an excellent article describing the practice and showing examples by gifted practitioners. I have observed this practice with interest for a few years now. It is brilliant, conceptually: more than most art mediums, weaving tapestry really is all about time. It is such a slow process that it makes the weaver acutely aware of the passage of time, and of the luxury of time that is necessary to complete any tapestry. Committing to a tapestry diary is a way to ensure that no matter how busy life gets, at least you can--must--sit down for 10 minutes and weave a small piece to mark the day. It can become a way to practice new techniques in tapestry, to hone one's skills. And it becomes a challenge to one's creativity as well, to continue to find, each day, a way a to make the process interesting, meaningful, and visually pleasing. I decided a few months ago to devote one of my small tapestry looms to a tapestry diary. I wanted to explore the sense I have that when I sit down to weave, time slows and becomes sacred again. Writer Wendell Berry famously said, "There are no unsacred places; there are only sacred places and desecrated places." I believe the same is true of time, of the precious minutes, hours and days we are each allotted. Weaving tapestry allows me to become aware again of the sacred gift of time, to re-enchant and hallow the day. So I decided my diary would begin with the first day of Advent, the start of the year in the Christian liturgical calendar, and it would use the colors of the seasons of the liturgical year. Advent, the four weeks leading up to Christmas, began last Sunday, and its liturgical colors are dark purple and navy. In contrast to the secular world's glitzy, frenetic, highly decorated approach to the season, in the church it is a dark season, full of apocalyptic readings and the sense that the world has grown especially dark just before the birth of Christ. 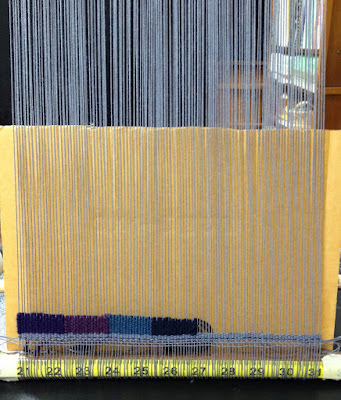 So I have begun weaving simple rectangles of dark purple and blue, seven across so that each row of weaving will represent one week. Here's where it is today, on Wednesday of the first week. Not much to look at yet, but a start. 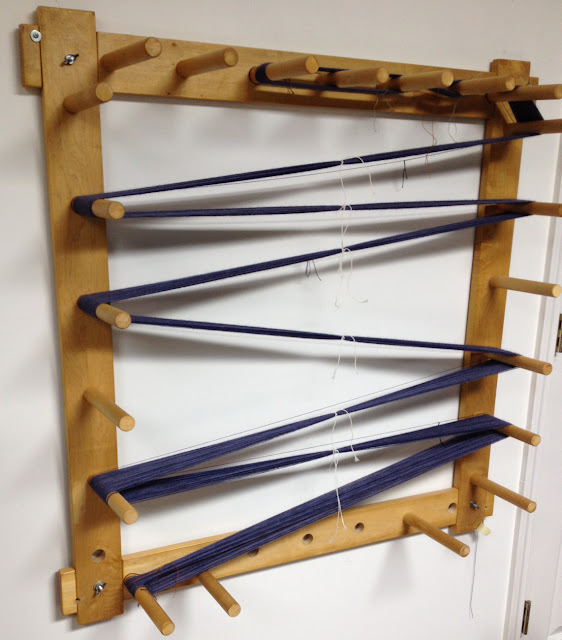 For those who are interested in the technical details, it's sett at 10 epi and I used 12/6 cotton seine twine as warp. Speed is not the point. Each day, deal with that day's challenge or problem. 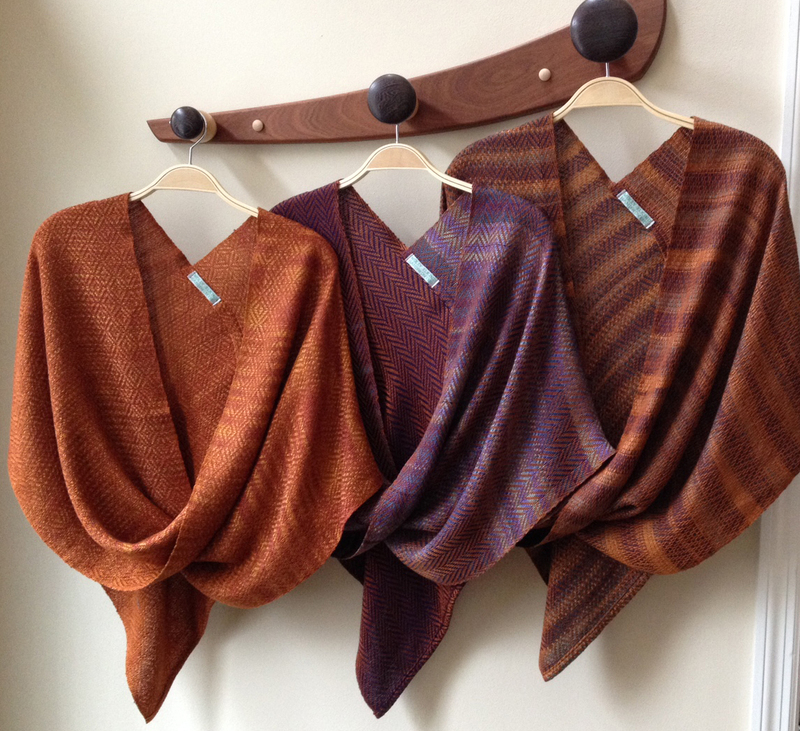 What would it be like to bring the same care I bring to weaving, to other parts of my life?